Is the Music Industry in the Midst of a Resurgence? For the first time in several years, the music industry saw their global revenues grow, with digital revenues overtaking physical for the first time. This is a good sign for an industry whose current revenue is about one-third what it was at its peak in 1999. Most of this growth is due to the dramatic rise and popularity of streaming services such as Spotify, Apple Music, and the recently launched Amazon Unlimited Music. But not all revenue comes from people pressing play. Spotify paid a total of $1.8 billion to artists and record labels last year. In a blog post, YouTube’s Chief Business Officer announced yesterday that they had paid out over $1 billion to the music industry in the past 12 months, from advertising alone. YouTube’s decision to publicize this information is a strategic move on their part. It shows how ad revenue is another potentially lucrative revenue stream for artists and their record labels. More importantly, it helps to deflect accusations that YouTube, along with many other streaming services, pays substantially lower royalties at the expense of artists, songwriters, and record labels. In their blog post, YouTube proposes a vision of the future where the music industry closely resembles the television industry, and subscriptions and advertising (supported by digital and physical sales) make up the majority of revenue. For businesses hurt hard by digital streaming, any additional income would be welcome. And at a time when marketers are increasingly targeting online audiences, platforms such as YouTube offer clear value for anyone looking to expand their reach. The problem is that it’s an uneven playing field. In this scenario, music labels and artists face a difficult choice: they can either continue to allow people to play their music on YouTube, for significantly less than their usual royalties, or they can pull their music from the site and lose exposure and ad revenue. 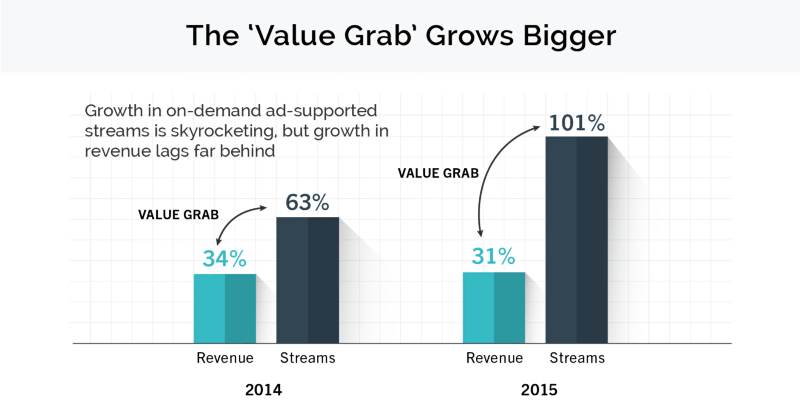 The chairman and CEO of RIAA, a trade organization that purports to represent the recording industry in the United States, wrote about the worsening disparity between the growth of the number of ad-supported streams on sites such as YouTube and the growth in revenue those streams generate, as shown in the chart below. In my previous article, I wrote about how Twitter is currently struggling to grow its monthly average user numbers and become profitable using its current business model. In some ways, the challenges facing the music industry are very different: demand for their product is steadily increasing, and slowly but surely revenue is being made. However, like Twitter, it is having trouble finding a business model that will reward the content creators and incentivize creativity. And like Twitter, the music industry is at the mercy of things outside of their control: where Twitter struggles with users who post racist and sexist content that damages their brand, music companies struggle with services that squeeze almost all profit out of the business, making it difficult to produce a wide variety of quality content. The future is bright, though. The money from ads that YouTube pays to record labels works both ways: on the one hand, the record companies need that revenue; but on the other hand, YouTube also makes money from those ads. If musicians were to refuse the use of their music for advertising purposes, they would not be the only ones hurt. In that sense, music companies now have a bargaining chip that they will hopefully use to right the balance of power between music platforms and musicians.